The total number of students with you — so we can have your perks ready for you at the end of your visit. The total number of parents that your payment covers — so we can give you the correct number of admission stickers. The total number of teachers, aids and bus drivers — so we can provide the correct number of stickers for their admission. Note: The coupons for free return tickets that we give students attending a field trip at CM Farms [or] tickets won on the radio and TV apply ONLY to weekend admission. They cannot be used for field trip admission for students, parents or siblings. Please have ONE person pay for all attending the field trip, students and parents. We understand if your school doesn’t accept parent money. If that is the case, parents can pay once they arrive. If they pay here, it will $9.00 plus tax. Checks should be made out to CMFarms, LLC. 200 John Broussard Road Dry Creek, LA 70637 ( CM Farms Road was originally named John Broussard Road and still shows the original name on some devices.) You will actually turn onto CM Farms Road. Teachers, please be sure you provide your students with plenty of drinking water. We do not have water fountains, however, we have bottled water for sale. Please have each student bring a sack lunch. Students will be able to buy candy, and drinks from the Country Store or concession. Our Concession Stand will be open for ADULTS to purchase food. Option: You may pre-order pizza for your students lunch, also! The Country Store will be open with our Fudge, vegetables, jellies, jams relishes and pickles! We will also have t-shirts, Lighting toys, glow sticks, and MAiZE patches for sale. We have restroom facilities in the main pavilion. Germ-X is located at the animal area. hay bales for the students to sit on, so please check on any allergies pertaining to hay. If a student has an allergy, the student must bring appropriate medication. We will not administer or distribute any type of medication. Go to Spookley website and log in as educators for FREE lesson plans and activity sheets for your classroom!!! Also, Spookley just launched the new Spookley the Square Pumpkin “Stop Bullying Before it Starts” Teacher Toolkit (click here to receive yours). Our field trips feature a learning experience focused on life on the farm, with unique, fun, educational activities that expose children to agriculture. Many are combined with farm adventures, such as: corn maze, exploration, wagon rides, etc. Hands-on learning experiences are always best when students have been prepared for what they are about to encounter and are able to then discuss what they learned afterwards. 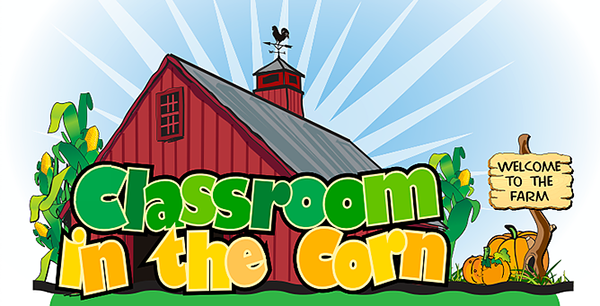 We are pleased to offer our Classroom in the Corn learning series to make your field trip more exciting and memorable … as well as a better learning experience. These Teacher Resource Guides are broken into separate grade ranges and each include: activity goals, National Curriculum Standards, preparation required, materials needed, worksheets, and step-by-step instructions. View a sample of that curriculum. Upon scheduling your field trip, you will receive a password allowing you to download the links below.